Tupua Productions Principal Polynesian Dancer . Leave your worries and cares behind as veteran entertainer Stephan TUPUA Seanoa leads you on an adventure through a tropical paradise. With the spirit of Love and Aloha, the magnificence of the South Seas comes to life. Your journey will take you from one heavenly Polynesian island to the next. You will witness the primitive Samoan flaming fire knife dance; feel the beat of the rhythmic Tahitian drums; and the lovely TUPUA Hula Maidens will enchant you with their graceful Hulas, beautiful smiles, long flowing hair, and costumes filled with the colors of the rainbow. The award winning cast of TUPUA takes great pride in providing the finest Polynesian culture and family entertainment today. 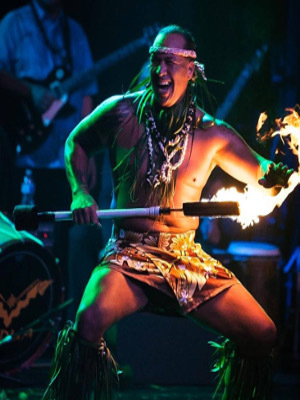 Our first class Polynesian variety show will feel like a pleasant dream from which you will awaken filled with the true... Spirit Of Aloha! For Your Next Premier Polynesian Events, Contact Tupua Productions!. Register For Our Weekly Dance Classes Or Our Island Cardio Workshop Now!.